19% of households nationally have multiple adult generations or grandchildren living with grandparents under one roof as of 2014, according to the Pew Research Center. This percentage has increased steadily since 1980 when it was 12%, and up sharply from 2009 when it was 17%. The rise from 2009-2015, equal to an additional 5.5 million people in multi-generation households, is a sign of the tumultuous times, as many people were forced to move and cohabitate with parents and children in the aftermath of the job losses experienced during the 2008 Great Recession. Ethnic minorities have the highest share of multi-generational households. However, Pew notes the share of multi-generational households is growing across all ethnic groups. 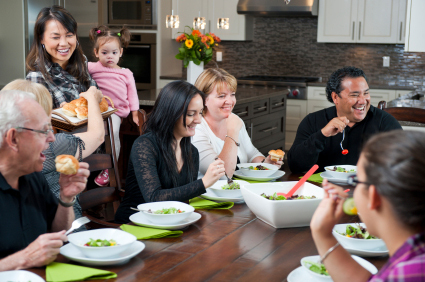 15% of White Americans live in multi-generational households. One reason for the growing trend in multi-generational housing is due to young adults staying in the nest longer — or moving back in with parents after college. Surprisingly, this is not a new trend, having started in the early 1990s when young adults aged 25-29 broke with tradition and began to beat out those aged 85+ for living in multi-generational households. As of 2014, 31% of young adults lived in a multi-generational household compared with 24% of the elderly. California has the most multi-generation families, with seven of the top ten metros for three-generation households found here, according to Trulia. 746,000 households consisted of three or more generations in California as of 2014, according to the U.S. Census. What makes California so distinct from the other states in this regard? California’s high housing costs is the likely culprit. Home prices and the price of rents are both far above average compared to the rest of the nation. With so much of residents’ paycheck going toward rent — near 50% of the average paycheck in places like Los Angeles and San Francisco — moving in with family is a reasonable, and sometimes necessary, option to make ends meet. Further, unless residential construction increases sufficiently to bring housing costs down, the multi-generational housing trend will most certainly continue. Lawmakers and lenders alike foresee this continued trend. For instance, Fannie Mae’s recently introduced HomeReady program encourages multi-generational living by including income sources from non-homebuyers who will occupy the property with the homebuyer when qualifying the buyer for mortgage financing. Pending California legislation also observes the need for more housing. For example, Assembly Bill 2299 will make it easier for homeowners to add second units like casitas or granny flats — attached, freestanding or over-the-garage apartment without direct access to the main house — by eliminating parking and passageway requirements. Expect to see a continued higher demand in the coming years for homes with in-law suites or casitas. California’s unique demographic mix and high cost of living ensure multi-generational living is here to stay, so set your marketing and business strategy accordingly.